Spectrum Records SP-EM 1 / SP-EM 2 45rpm 7" vinyl record. VG Vinyl: glossy with substantial scuffs & scratches. 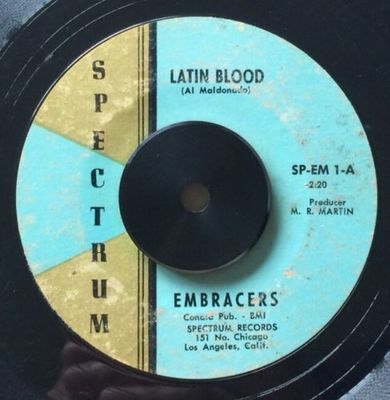 Click on MP3 to hear the full Ron and The Embracers 45 record being sold. Please review my feedback and buy with confidence. I combine shipping. If you win multiple auctions, please wait for combined invoice. Records will be mailed in professional cardboard mailer between two cardboard flats. Payment must be made within 5 days after auction has ended. Thank You.